Formerly Upper Volta. 13,574,820. National or official language: French. Literacy rate: 19.2%: 29.5% males, 9.2% females (1998 UNESCO). Also includes Jowulu (1,000). Information mainly from J. Bendor-Samuel 1989; SIL 1973–2003; Institut de Recherche des Sciences Sociales et Humaines and the Centre Nationale de Recherche Scientifique et Technique (Tiendrebeogo 1983). Blind population: 50,000. 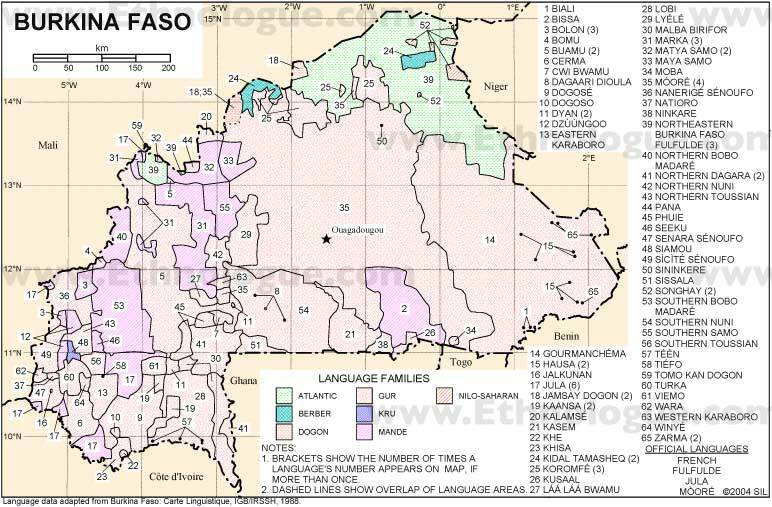 The number of languages listed for Burkina Faso is 68. Of those, all are living languages.